I would like to #BreakBarriers of blogging and would like to give continuity to blogging which I had slowed down since arriving to Australia for various reasons. 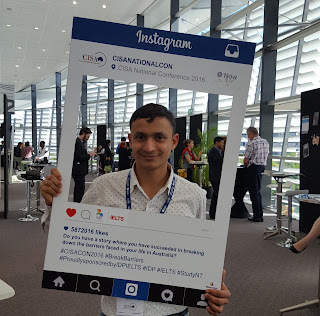 In this post, I am going to discuss my first ever experience of attending a Conference and reflect upon the lessons I learnt there. It was an amazing experience to represent my University, La Trobe, in the Council of International Students (CISA) National Conference 2016 that was held in Darwin between July 5-8. The Conference was fantastic opportunity to meet with lots of fellow students from different universities in different states and coming from diverse backgrounds and listen to their student stories and issues. Also we got chance to hear from different stakeholders such as industry delegates, education officers and the immigration officer to name a few. It was very delighting to learn about the huge amount of efforts that different organisations are putting forth for improving the educational experience of international students which made me feel really grateful. Also we learnt that there still are a lot of rooms for improvement which were well acknowledged during the conference especially in the areas of concession for students in public transport, workplace issues including racism and discrimination, accessing the student services, changing job market and related global trends, and so forth. However, it was also acknowledged that students were not getting expected experience due to their lack of proactive approach in seeking out for opportunities within their university and community, which is very true. We had very engaging workshops on "Social Innovation" and "English Communication Skills", roundtable discussions on "Future of CISA" and "National Strategy for International Education", panel discussions on "International and Transnational Education" and the "Future of Australia's International Education Sector", and an information session by Fair Work Ombudsman on Workplace Rights and Education Agent (AUG Student Services) all of which were very informative and helpful. I also enjoyed the social functions that accompanied the conference. Each day we had one social function as follows: Barbecue Dinner at Casuarina Beach, Welcome Reception at the Parliament House, Visit to the Mindil Beach Markets, and the Gala Dinner. We attended first three of those and found them very enjoyable after the huge day. I would like to express my sincere thanks to La Trobe University for sponsoring me to attend this conference and have an amazing experience of my life. I feel highly indebted to the University Administration and particularly the "International Student Services" team who have been helping me a lot to engage and expand my experience beyond the lecture theatres. Also, I would like to thank CISA Executive comittes for organising this program for us. I would like to spread the message for all the students to seek out for opportunities actively and get the benefits that you all want and deserve. PS: I will be posting out useful information that I learnt from the conference in the upcoming posts.